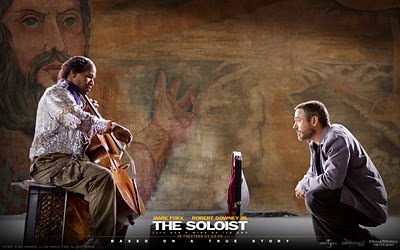 Recently I had the pleasure of watching the 2009 film The Soloist for the second time. The film is an adaptation of a true story, and from what little research I’ve performed it’s fairly accurate. The main character is Steve Lopez (played by Robert Downy Jr.), a journalist working for the LA Times who needs a story idea. As he’s wandering around town he encounters a homeless man playing a two stringed violin. For the heck of it he strikes up a conversation and learns that this man’s name is Nathanial Ayers (played by Jamie Foxx) and that he appears to be somewhat mentally unstable. Ayers talks rapidly, throwing out observations about the world and observations about music laced with sudden non sequiturs and what seems like nonsense. Amid all this jabber Lopez hears that Ayers claims he attended Julliard, the prestigious art conservatory. Lopez, thinking it might make an interesting story if true, does some research and confirms that Ayers was a student at Julliard before dropping out in his second year. He hunts down Ayers, talks to him a while, and then does so more research. Slowly the full story is uncovered. Ayers was a talented cellist, and was dedicated to music and hard practice as a young man. His skill and hard work got him accepted at Julliard, a huge step up for the son of a poor hairdresser. Unfortunately Ayers began to experience symptoms of schizophrenia while attending. The disease led to him dropping out, and eventually to him ending up homeless on the streets of Los Angeles. At first Ayers is just an interesting story for Lopez. He’s just another of a long list of possible article ideas. “Homeless man, once brilliant musician, now plays a two string violin on the sidewalk.” It’s the kind of story that people are interested in reading. One reader, an old woman who used to play the cello before arthritis took away her ability, donates her instrument to Ayers so that he has a decent instrument to play. Lopez delivers the instrument and continues to interact with Ayers in the hopes of getting more columns out of him. As Lopez enters his world and interacts with other homeless individuals stuck on the streets he find himself slowly caring more about Ayers as a friend than Ayers as a story lead. This movie also features the most compelling and horrifying depiction of schizophrenia I’ve ever seen. Ayers suffers from auditory hallucinations (in other words, voices in his head). Most depictions of schizophrenia I’ve seen the medium of film feature harsh, rough, demonic voices laughing and mocking the person in question. Others depict the voices as monsters or talking reflections, etc, which is pretty heavy handed and lacks authenticity. When Ayer’s voices arrive they take the form of a calm woman’s voice with excellent pronunciation. The voice is not emotional. It sounds much like a very professional woman announcing evacuation instructions over a PA system. It’s the content that is frightening, as the voice informs Ayers that everyone can hear his thoughts, that he shouldn’t think, that he must be careful, etc. The woman’s voice is loudest but with her comes many other voices, each equally calm, and each saying something different. The effect is powerful. After watching Ayers lose his composure under the onslaught of voices I felt like I could understand his experience. It was very real. I can easily imagine what it would be like to have voices like that in my head, and to be unable to silence them. I did some research, and found that many psychologists were pleased with the film’s depiction of schizophrenia, saying that it was fairly accurate. As Lopez and Ayers become closer Lopez tries to help Ayers improve his life. He convinces Ayers to play his instrument in a safe place, at a local homeless shelter. David, the shelter’s director, understands the homeless much better than Lopez. Lopez wants to fix Nathanial: he wants to set him up with an apartment, get him on medication, etc. This is understandable, but Nathanial doesn’t want an apartment, and he is extremely resistant to seeing any kind of psychologist. One thing Ayers would like, however, is a friend. Ayers doesn’t see Lopez as a benefactor who can help him, but as another person who he enjoys talking to. This captures the struggle we face when trying to help the homeless. We want to set them up with things; a house, medical care, a job, etc. These are all good, really good things. But if we think of homeless only as people who are defined by their lack of possessions then we are missing the point. The forces that lead a person to the streets are many, varied, and always complicated. They can’t be solved quickly or easily. If you go out to help the homeless don’t be surprised if some of them take offense to you trying to “fix” them. Yet the opposite stance is also clearly wrong. We can’t just put ourselves at ease by saying “Well the homeless don’t always want the things they lack. It’s just a different lifestyle choice. Throwing money at the problem doesn’t work.” These people do need help, and your money can have a big impact on their quality of life. The problem is that their problems cannot be solved with a little cash and some discipline. If all a homeless person needed was some money and a place to stay, then there would be a lot less homeless on the streets. Go talk to someone who works with the homeless on a day to day basis and they’ll tell you that it’s not so easy. Later, after Lopez helps calm Ayers down during a stressful moment, Ayers tells Lopez that he loves him. Lopez later confesses to David that “I don’t want him to love me.” He doesn’t want to let Nathanial down. He doesn’t want to be important to Nathanial. He tells David get Ayers on medication. David says Ayers isn’t ready or willing to sit down with a psychiatrist. Lopez wants to force Ayers to. Lopez even considers lying to the authorities in order to Ayers committed to a mental institution so he’ll receive the help he needs. David responds by pointing out that unless Ayers is willing to treat his condition than all Lopez will do is alienate him and ruin their friendship. He tell Lopez that “Nathanial has one thing going for him right now: a friend” Lopez replies “I don’t want to be his only thing.” Later Lopez’s ex wife points out that as long as he’s holding himself back he’s just exploiting Nathanial. He has to decide: is Ayers a friend or a story idea? At the same time Ayers does have a very serious problem. His schizophrenia can be crippling, and leads to sudden moments of extreme distress and frightening actions. The film does not sugar coat his condition. It’s extremely easy to sympathize with Lopez’s desire to get Ayers help at all costs, and I believe this was intentional. The film is trying to highlight how complex the situation many homeless people, and those who seek to help them, are in. There is a minor subplot involving the mayor pledging to revitalize skid row and help the homeless, which results in a police crackdown on lawbreakers around the city. This heavy handed response ends up imprisoning and alienating the people that the mayor supposedly wants to help. This is probably one of the low parts of the movie, and I’d say it should have been cut out altogether, except it does lead to an excellent scene of Lopez trying to track Ayers down, worrying that he was beaten and sent to a hospital. This in turn leads to an extremely powerful scene where Lopez is reunited with a healthy and fairly happy Ayers. Things seem great. Ayers has started sleeping in an apartment Lopez has provided, and seems pretty stable. Then Lopez gives Ayers some papers he needs to sign so that Ayers’ sister can become his legal executor. However things become frightening quickly when Ayers reads the papers, which state that he has schizophrenia. Lopez tries to explain it away as legalize, but Nathanial isn’t listening. He becomes convinced that Lopez is trying to put him away. He lashes out at Lopez, hitting him and yelling angrily. He throws Lopez against a wall and then covers Lopez’s mouth with his hand. He holds Lopez down and strikes at him, all while ranting about how he can take care of himself and nobody is going to take him away. As he holds Lopez down on the floor with his foot Ayers threatens to cut him open like a fish if he ever sees him again. Lopez flees the apartment and Nathanial, clearly upset, sits down and talks rapidly to himself. He seems afraid now instead of angry. He begins to cry. When I saw this movie for the first time I was taken aback at this scene. I thought hard about what I would do in that situation. Would I ever try to reach out to Nathanial again? I decided that I wouldn’t. It was too risky. At the very least I’d hide some kind of knife proof vest under my shirt if I tried to see him again. Lopez has more faith than that, and puts me to shame. He’s not afraid to see Ayers again. Ayers’ sister flies into LA and Lopez drives her down to the mission to see him. He waits patiently outside for them to finish talking to each other. After a long while Ayers comes out. He is clearly in distress and apologizes for what he did and said. Lopez says it’s no big deal, friends fight. Nathanial responds saying that he couldn’t imagine he’d want to be his friend after this. Lopez holds out his hand, and says he’s honored to be Ayers friend. At the end of the movie Nathanial is off the streets, but he’s still mentally unbalanced. Lopez doesn’t know if his friendship has helped Nathanial. But Lopez does say that Nathanial has helped him. The aspect I enjoy most about this movie is it’s subtlety. There are many points in which it would be easy to hit the viewer over the head with some heavy handed moral. It would be so easy to paint someone as a villain in this piece. Instead this film chooses to be less narratively satisfying, simultaneously becoming that much more real. The fact that there is no villain to the story drives home the point that the film is trying to make. Namely that the problem of homelessness is not an easy one. There is no pat answer to it. There is no scheming fat cat with a cigar who we can blame for all this. There is no dragon to slay here. Instead there are only people who have been caught up in the whirlpool of life and spit out into the streets. People with mental problems. People who have made terrible choices. People who have been dealt a bad card. And throwing money at the problem won’t help them out of their bad situation. At the same time they do need help. There are no satisfying answers to Ayers’ problems. At the end of the movie he still has some serious issues, issues that may never be fixed. But he also has a friend. My final verdict: this movie isn’t perfect, but it’s definitely worth a watch. Posted on August 19, 2013, in Mark at the Movies, Movies and tagged Movies, Review, The Soloist. Bookmark the permalink. Leave a comment.